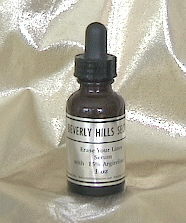 BEVERLY HILLS SECRET SERUM with 15% Argireline is unlike any other. The Secret is out! CAN A SKINCARE PRODUCT REALLY MAKE LINES AND WRINKLES DISAPPEAR? Too good to be true? Thats what many women thought before they tried "Beverly Hills Secret" SERUM. 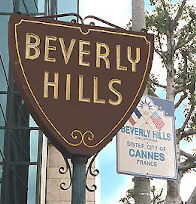 "BEVERLY HILLS SECRET" SERUM with with 15% Argireline turned skeptics into believers by making lines and wrinkles much less noticable in only a few weeks. Find out for yourself and let your Eyes be the Judge if. ...without the dangers and the cost of Botox Injections. This is Hollywood's best kept Secret! Their Faces are their Fortunes, but long hours under hot lights and heavy makeup can wreak havoc on a Celebrity's Skin. So what's the Secret to keeping Faces looking young? Face-Lift-In-A-Bottle Turns Back The Clock 10 Years In Only 30 days! Let your Eyes be the Judge! Erase Your Lines with 15% Argireline! Argireline� Commonly referred to as "Better than Botox"
Argireline�, the active ingredient in BEVERLY HILLS SECRET SERUM, is a safe, non-toxic, topical alternative to botulinum toxin type A (Botox�), that has been scientifically proven effective in reducing wrinkles and preventing the formation of new lines in a safe and natural manner. Thanks to substantial progress researchers have made in understanding the cellular changes that bring about skin wrinkling and sagging, this remarkable new serum has been developed. Argireline is a patented blend of amino acids (the building blocks of protein). Research shows a 17% reduction in the depth of fine lines and wrinkles after 15 days and up to 27% following 30 days of treatment. The discovery of this hexapeptide (six naturally occurring amino acids in combination) was an exciting find, as Argireline� has proven to inhibit two internal processes that strongly contribute to the formation of wrinkles. 1. The SNARE complex a natural formation of proteins in aging skin that stimulate neurotransmitters, provoking facial muscle contractions, thereby causing wrinkles and lines. 2.The overproduction and release of catecholamine-hormones, such as adrenaline, which affect the sympathetic nervous system and cause wrinkles through repetitive facial movements. By inhibiting both the SNARE complex and overproduction of catecholamine, skin smoothes out and new lines are never formed. The method by which Argireline� works, and the resulting relaxation of the facial muscles produced by topical application of Argireline�, is similar to that of botulinum toxin type A, but without the frightening potential side effects of this toxin and without paralyzing the muscles. Serum goes first on cleansed Skin and makes every Product you ad on top work better. It works with and enhances all 'your favorite' Products. Apply twice a daily (AM/PM) to cleansed skin. Gently massage the areas around the eyes, forehead and lips and neck with your fingertips. After 60 days, only one application per day is needed to maintain results. Hyaluronic acid has the ability to hold up 1000 times its weight in water.Hyaluronic Acid (HA) is a natural protein in the deeper layers of skin (dermis). As we age wrinkles and other outward signs of aging occur due to loss of (HA) Hyaluronic acid. HA Hyaluronic acid has a potent delivery system to transport the Hyaluronic acid directly to the deeper layers of your skin (dermis), since it is most efficient when topically applied to skin (therefore a very effective moisturizer). This indeed is a most important discovery by medical science. Hyaluronic acid is very close to the injectable matter in Restylane which is used as a cosmetic filler to aide in plumping lines and wrinkles. Argireline works through a unique mechanism which relaxes facial tension leading to a reduction in superficial facial lines and wrinkles with regular use. Argireline has been shown to moderate excessive catecholamines release. Anti-age hexapeptide developed with the combinatorial chemistry and high throughput screening techniques. *All information presented throughout this web site is for educational purposes only; statements about products and health conditions have not been evaluated by the U.S. Food & Drug Administration. Please consult your healthcare provider before starting any course of supplementation or treatment, particularly if you are currently under medical care. Make sure you carefully read all product packaging prior to use. If you have or suspect you may have a health problem, you should consult your Healthcare Provider.